Total Workshop search results: 21. 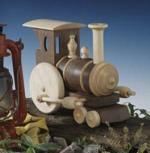 Displaying Page 1 of your woodworking search phrase TRAIN LOCOMOTIVE. You definitely need to be an armstrong to operate one of these locomotives! This western design is a good pattern for beginners to practice turns and points. Full steam ahead as this train rumbles its way down the tracks! This western design is a good pattern for beginners to practice turns and points. This Christmas train is made from plywood with pull-apart construction for easy storage. Build it from full-size traceable patterns. The locomotive measures 39 inches long by 22 inches tall, and all four pieces are 8 inches wide. This is a vintage woodworking plan. Visit our FAQ page for a full definition. View the Larger Image Slideshow to see the actual item you are buying. This Christmas Train Ornament is sized 7-3/4 inches wide. Easily resize the pattern on your printer to make the size you want. We scaled ours to 4.5 inches wide so that it would hang from our Ornament Stand number 05-WP-424. A perfect beginner project for scouting, guides and 4H Club woodworking projects. This Christmas Drum Ornament is sized 7 inches wide. Easily resize the pattern on your printer to make the size you want. We scaled ours to 4.5 inches wide so that it would hang from our Ornament Stand number 05-WP-424. A perfect beginner project for scouting, guides and 4H Club woodworking projects. 1835 Locomotive woodworking plans - Three cars and a trestle bridge. A classic steam locomotive from an era when machines were celebrated art. 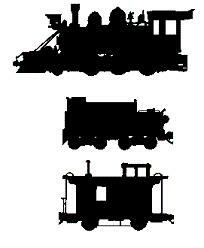 Full size drawings for the engine, coal car and coach. Fun to make from scrap wood pieces and they will decorate your Christmas season for generations to come. Patterns included: musicians horn, reindeer, candy cane, rocking horse, peace dove, burning candle, gingerbread man, gingerbread woman, train locomotive, bells, angel with trumpet and poinsettia. They are great for gift-giving or decorating your own tree, wreath or garland! Finished projects measure 3 to 4 inches each.